He raises his figures on a pedestal. The everyday life moment becomes something sublime. The human being is in the spotlight and communicates with his observer. 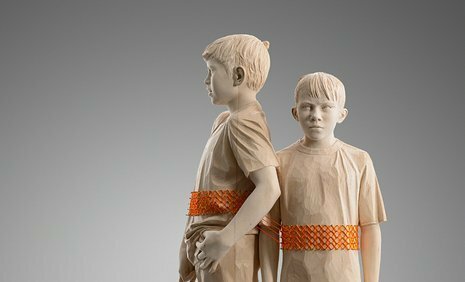 Matthias Kostner, a young artist from Val Gardena, creates wooden figures inspired by situations of the daily life. 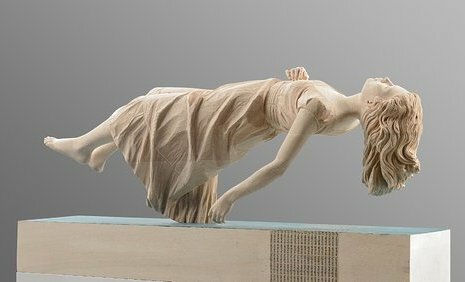 He lets his figures sit, lie down, jump, float, read, play ... he creates wooden snapshots with lifelike facial expressions and gestures. 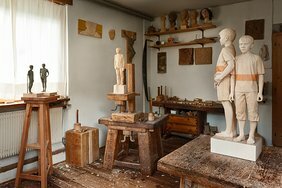 He was born into a family of artists who have created woodcarvings for five generations. Some of them were renowned for their sculptures of saints, while others became famous on international level for making altars and exporting them overseas. Others followed their artistic inclination without any compromises. 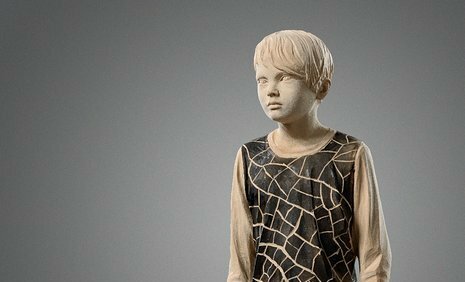 Matthias Kostner, born in 1982, grew up in this context with a sense of tradition and know-how of contemporary art and is committed to traditional sculpture. He creates figures from everyday life, metaphors without existential pathos. His works have a great expressive power and they radiate the continuous and unalterable flow of life. 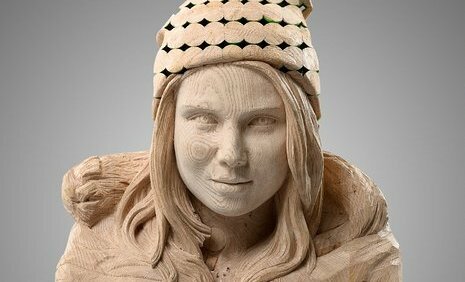 The figures express dignity, pride, expressiveness and are characterised by something enduring, carried on from the invisible lines of history and culture of Val Gardena. What matters are not gags, art quotes, statements or provocations, but good craftsmanship, proportions and the understandable expression of the intensity of moments. Sculpture embodies the world’s energy and the permanent change of existing things. 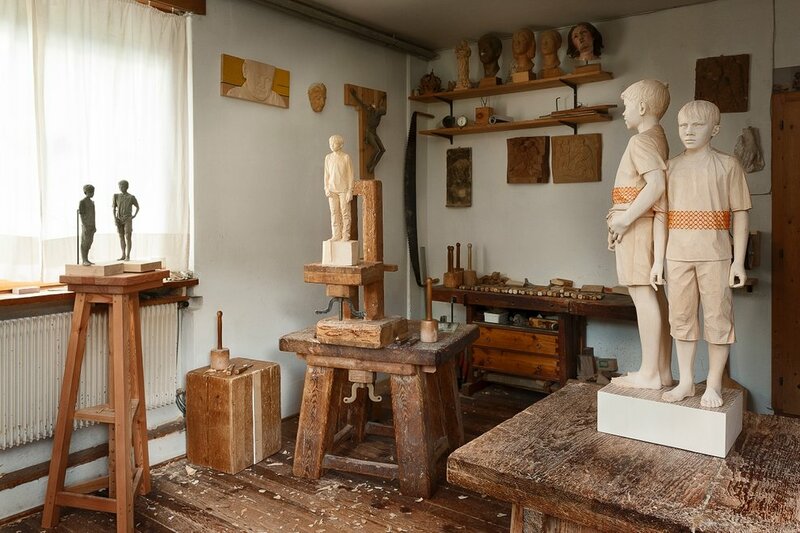 Alberto Giacometti or Constantin Brancusi inspire Matthias the same way as his ancestors do: his father Felix and his two uncles Leo and Joseph. The latter is an artist who caused a great stir with his “mutilated” cement statues and who - together with other artists from his hometown - founded the group “Ruschel” in order to introduce new aspects to the local way of conceiving art, nearly half a century ago. This artist visited Henry Moore to find confirmation for his artistic ideas; he is an artistic spirit who was always close to his nephew Matthias. Also Matthias knows that one of the components of art is to transcend boundaries and venture into unsecured areas - and for him, this simply means the return to classical sculpture in motion. 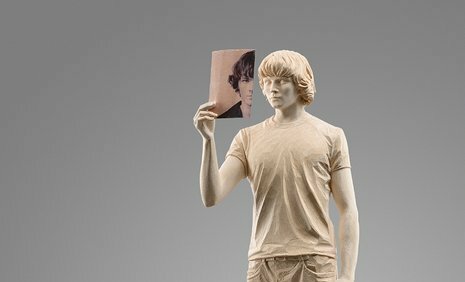 Thus, the main subjects for Matthias’ creations are humans in motion, people in action: biking Asian migrants, the climber in the World Heritage site of the Dolomites, the reading girl without identity. A common element for his statues is a barely legible reverse script on the pedestal, which is the stage for his nearly life-size figures that communicate with their observers and let them perceive the message. Kostner also repeats one same idea in the serial thoughts. This way he stresses his idea when it crosses his mind for a longer period of time. Rarely his figures rest: a young sitting girl with dreamy eyes, wearing fashionable clothes; the folds in her dress, her limbs and her curly hair are carefully carved; her clothes and her hair are gently wrapped in colour. Another example is the boy from next door who you think to know and who is presented with a stoic attitude and a particularly calm expression. There is a striking contrast between his dark vest and the orange pedestal. Quite different, but not less fascinating, is the statue of a woman with fluttering hair which seems to float over a blue glass floor. A young woman wearing modern clothes is sitting on a green glass base. She stretches her leg forward and looks calmly towards an imaginary observer. 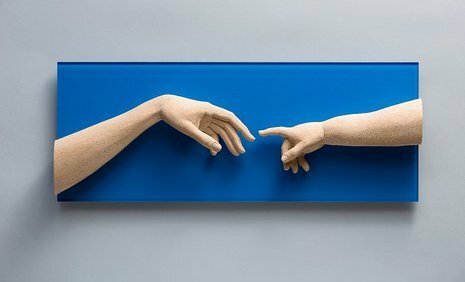 Again, the colour plays a secondary role; more important are the shapes the artist carefully carves into the wood, which is the most important material for Kostner. He argues that such materials as bronze, stone, clay or gypsum are amorphous and anonymous, while wood is far from being static and can convey the feeling of Pantha Rhei, the cycle of coming and passing. Wood requires an understanding of what it is. It has traces in its fibers, its colour, its density; it tells us something about the way it went in the past. Kostner wants to preserve these properties and at the same time mark it with his personal touch. He brings new life into a living material. The wood gets painted by a subtle touch of acrylic colors. The caption often consists in implied letters or in printings out of a magazine, in order to transfer memories and a mysterious identity which are difficult to read and do not permit any further research. Matthias Kostner has found his style: he doesn’t want to be a loud, protesting young artist who must search frantically for content – life and the human being themselves are enough to give birth to art. Communication in wood.